The Gunners suffered a double injury blow in Thursday’s Europa League clash with Sporting at the Emirates Stadium. Striker Danny Welbeck was the most notable casualty after he was stretchered off the pitch with an oxygen mask due to an awkward landing from an aerial challenge in the first-half. 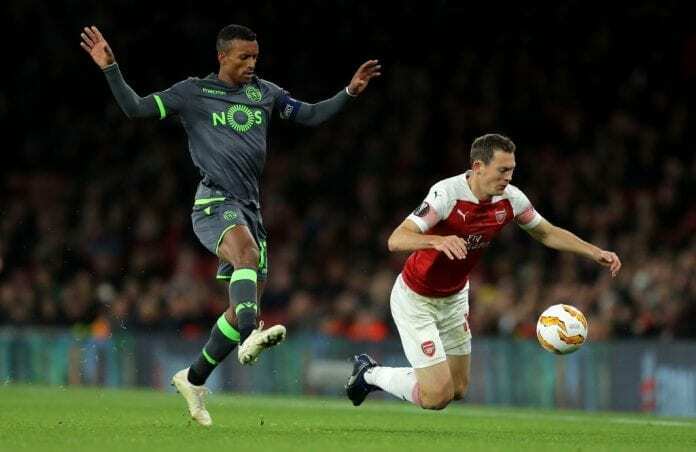 But Arsenal suffered another injury blow in the 70th-minute when Lichtsteiner was forced off with a hamstring problem. Ainsley Maitland-Niles replaced the Switzerland international in the defence as Arsenal settled for a 0-0 draw with Sporting. “The Lichtsteiner injury changed our idea in the match. We wanted to bring on Eddie Nketiah and give him a chance,” said Emery on Arsenal.com. 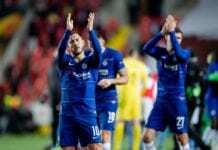 Chelsea host Slavia Prague at Stamford Bridge this evening looking to book their place in the next round of the Europa League. “When Lichtsteiner had this injury, we had to play with a right back. For this reason, we played Ainsley. “But for us, it’s good for Ainsley to play these minutes because he needs that to take the confidence and our rhythm. “We changed our idea tactically for the last 25 minutes [due to] the injury. Despite the draw, Arsenal have qualified for the knockout stages of the Europa League with two games to spare. The Gunners will next host Wolves on Sunday in a Premier League game with kick-off to begin at 17:30 (CEST).